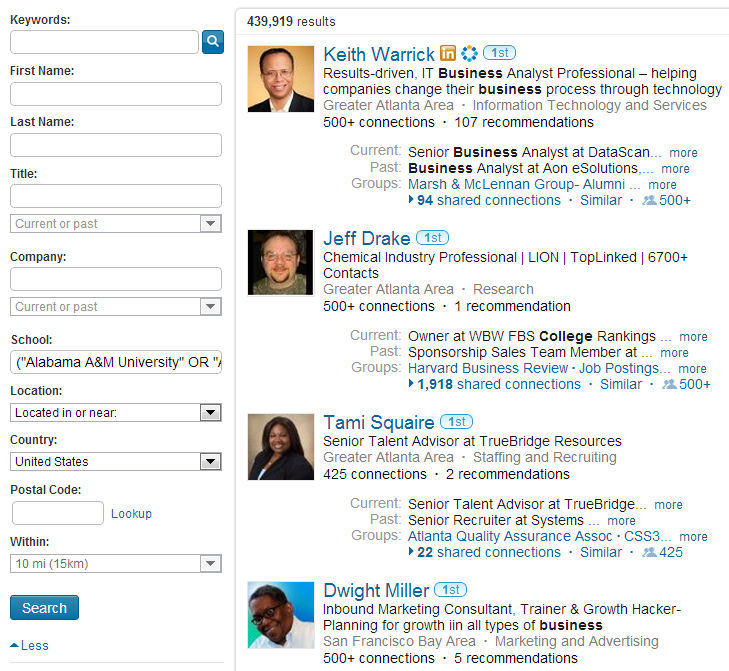 Note: I’ve updated this post as of August, 2015 with even more inclusive and effective diversity searches for LinkedIn. When it comes to diversity sourcing and recruiting, the first thing that comes to mind for many people is posting jobs on diversity sites and in diverse groups. However, as I have written about many times, posting jobs is an intrinsically limited talent acquisition strategy and it fails to expose you to the “deep end” of the talent pool. At best, posting jobs can only give you access to approximately 30% of the total talent pool – those active and casual job seekers who will actually take the time to run a search for jobs and apply to an opening. How can you access the other 70%? I’ve spoken at a few conferences this year (HCI, LinkedIn Talent Connect, SourceCon) in which I’ve detailed some Boolean search strings for diversity sourcing on LinkedIn, and I’ve had several requests for the specific searches I’ve demonstrated. While the search strings I’ve used in my presentations are already posted on the conference websites, I thought it would be a good idea to create and release some new and improved diversity sourcing search strings here for quick and easy access to some “starter” queries. However, it’s important to know that what I’m publishing is the tip of the iceberg. I have no idea what your particular diversity sourcing need might be, or even what country you’re sourcing in – it’s up to you to adapt what you see here to your specific needs. While I know some folks will be happy to simply snag the strings, what I really want my readers to get from this post is an understanding of and appreciation for the critical underlying thought process necessary for any successful sourcing endeavor, let alone diversity sourcing. When it comes to information retrieval, if you can conceive it, you can almost always achieve it – including diversity sourcing – and there are often many different ways to achieving your search goals. The “magic” of search strings does not lie in the Boolean logic or site specific search syntax, nor does it exist in the keywords and phrases you search for – the true power of search lies within your own mind. What is Your Diversity Need? So let’s get back to basics for just a second. When you’re creating and executing Boolean search strings for talent discovery, you’re really performing information retrieval. Information retrieval is the activity of obtaining information resources relevant to an information need. An information retrieval process begins when you enter a query into an information system (e.g., databases, the Internet, social networks, etc. ), and queries are simply formal statements of information needs. So when it comes to diversity sourcing, what’s your information need? This seems like such a simple question, but I honestly don’t think many people begin their sourcing efforts with this in mind. When it comes to gender diversity recruiting and sourcing, most people tend to think of searching for women’s groups, sororities, women-only sports, and women’s colleges, including searching explicitly for the words “Women,” “Women’s,” and “female” for an exploratory search into all of the various women’s groups. However, many of these approaches are extremely narrow in scope and low in quantity of results (e.g. “Society of Women” produces a little over 60,000 results in the U.S., and “Association of Female _____” returns just shy of 4,000 results). If you try and search for (“women OR women’s”), while you get nearly 2M results in the U.S., if you scroll through the pages, you can see that there are a fair amount of profiles of men that are returned, and that’s to be expected given that the search terms aren’t exclusive to women’s profiles – they can show up on men’s profiles too. As an example of something that is less obvious, outside of the box, and more exclusive to women’s profiles would be something I’ve hypothesized, tested, and confirmed on LinkedIn for years – searching for (her OR she), which returns nearly 900,000 profiles. For those who haven’t seen me present on that search before – do you know why it returns LinkedIn profiles of women? It works because “her” and “she” can be mentioned in the summary and recommendation sections of women’s profiles. Yes, (her OR she) is a bit clever, and yes, I’m a bit proud of the discovery, but it clearly demonstrates the fact that all anyone needs to do is *think* about what terms that could be searched for that would be relatively unique to the people you are trying to find and test any ideas you come up with to verify. While (her OR she) “works” in that it returns predominantly women-only results, it returns less than 1M profiles in the U.S. – so certainly not a big slice of all of the women on LinkedIn. Let’s try another more traditional search approach – women’s universities and colleges. That search returns just over 410K results in the U.S.
That’s less than my (her OR she) search, although of course you could use the -/NOT operator to make each search mutually exclusive and to eliminate overlap. That search returns nearly 1.2M results in the U.S. However, instead of trying these more traditional search ideas, let’s try to think of the single most inclusive way of finding women on LinkedIn. Well, what’s more inclusive than first names? Of course you can search by groups, sororities, and sports, but you can find a larger portion of people by searching by first name. Yes, there are thousands, and no, we can’t practically search for all of them – and certainly not in a single search. However, what you can do is go to a number of websites and find the most popular female names and search for those, which will statistically yield a significant portion of the women represented on LinkedIn. In the U.S., we can use the Social Security Administration website, which conveniently lets you search for the top 200 most common first names for girls and boys by decade. Fortunately, I’ve done the heavy lifting for you. I copied the top 200 female first names from the 1950’s, 1960’s, 1970’s, 1980’s and 1990’s into Excel, sorted them alphabetically, then removed the duplicates to come up with the most popular 417 names from those 5 decades, which nearly covers the entire span of LinkedIn’s strongest representation. You can then take that Boolean OR statement and enter it into the first name field in LinkedIn. Unfortunately, while that search *used* to work with a free LinkedIn account, that no longer seems to be the case, as I keep getting errors. It does appear that you can search for about half of that list at once in LinkedIn for free. Try it for yourself here, but I have to warn you, LinkedIn still appears to choke on the search when you try it with a free account. If you can get it to work, you can only view 100 results with a free account, and even then, you will likely run into LinkedIn’s commercial use limit. The best approach would be to use a premium LinkedIn account in which you can actually fit the entire search into the first name field and view up to 1,000 results at a time. In LinkedIn Recruiter, my search of 417 female first names returns over 38M results in the U.S. alone. When it comes to finding women on LinkedIn, how big of a slice does a little over 38M represent in relation to all of the U.S. women on LinkedIn? LinkedIn claims about 115M U.S. profiles. Assuming that this Forbes article is accurate in reporting that LinkedIn has an even ratio of men and women (51%/49%), then there should be approximately 56.4 M female profiles on LinkedIn. So the ~38.4M results from my search of the 417 first names I ran above could be capturing up to 68% of all of the U.S. women on LinkedIn (38.4M / 56.4M). Not bad for a single search, and massively more inclusive of any other way of searching for women on LinkedIn (groups, colleges, sororities, etc.)! Of course, if your diversity need is to find male candidates, you can do the exact same thing as above, using the most common male names. Is your information need to find racially or ethnically diverse candidates? Well then, all you have to do is think about what might show up predominantly, and ideally only on profiles of people representing specific racial and ethnic groups. What comes to mind for many people includes searching for groups, fraternities and sororities, and historically black colleges and universities. 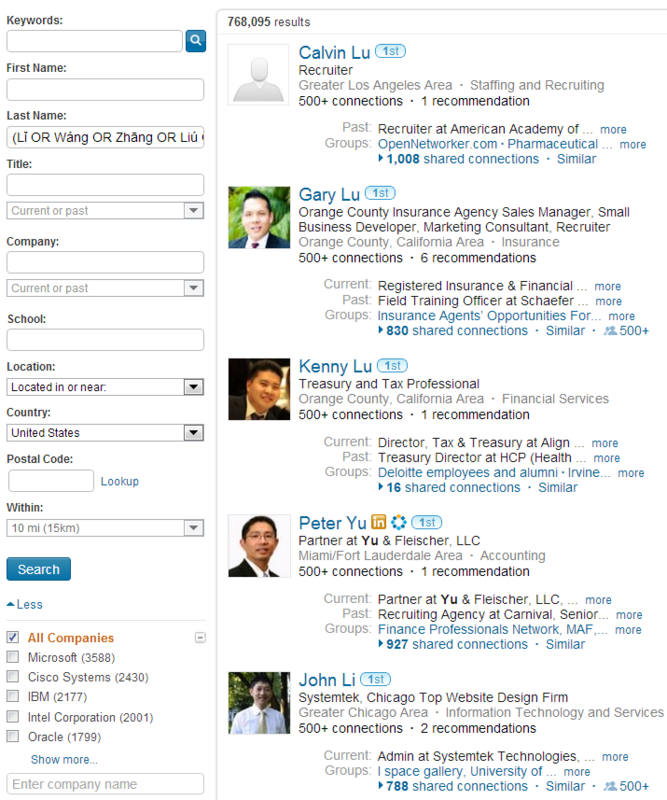 While people have been leveraging HCBU’s for years in their diversity sourcing efforts, unlike most (all?) ATS’s, resume databases, and Internet search engines, LinkedIn is the only place that I am aware of that can handle 3,000+ character Boolean search strings to allow you to search for all of them at once (thank you LinkedIn!). While anyone who performs diversity sourcing in the U.S. is familiar with HCBU’s, not everyone knows that you can also search for colleges and universities that have a high percentage of other racial or ethnic groups, such as historically Native American colleges and universities – here’s the search on LinkedIn – it all comes down to your specific need. If you’d like to take the fraternity/sorority approach, here is a LinkedIn search for African American fraternities and sororities. Depending on need, you can also construct queries for Asian American, Latino, LGBT, and other cultural interest fraternities and sororities. As with all information retrieval efforts, it comes down to your specific information need and discovering ways of achieving those needs. Speaking of specific diversity sourcing needs, you may be able to experiment with searching for last names to achieve your diversity sourcing goals. You could of course combine this approach with one or more of the gender diversity Boolean search strings if that would help you achieve your diversity sourcing goals. If you’re wondering if anyone actually performs these kinds of diversity-focused sourcing strategies, the answer is a resounding “yes!” I have people approach me all the time at conferences referencing how they’ve successfully leveraged the diversity sourcing strategies and tactics outlines in this post. Recently, while attending and speaking at the always awesome Talent42 technical recruiting conference in Seattle, I had someone tell me how they leveraged the most common Korean surnames to find a bilingual engineer which made short work of the otherwise seemingly impossible challenge. To be sure, what I’ve demonstrated here has some obvious limitations and is far from perfect, but it does effectively illustrate that you do have some creative proactive sourcing options for underrepresented gender and racial/ethnic groups in your organization, allowing you to move beyond relying solely on posting jobs and hoping to get qualified (and diverse!) applicants from active candidates. 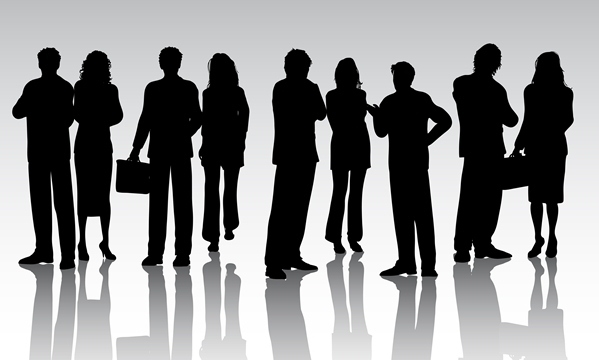 Proactive diversity sourcing has the distinct benefit of giving you access to the deeper end of the talent pool – those people (typically more than 2/3rds of any given population) who aren’t actively seeking employment and thus cannot be reached through any form of job advertisement, no matter where you post or share it. Ultimately, what I really wanted to accomplish by writing this article was to get you thinking a little bit differently when it comes to diversity sourcing and sourcing in general. Effective sourcing, diversity or otherwise, isn’t about Boolean search strings – it’s about critical thinking and always seeking to step outside of the box to find ways to meet your information needs. As an added bonus for reading this entire post, here is a LinkedIn search of the top 200 most popular female first names in the United States from the 1950’s, 60’s, 70’s, and 80’s de-duped to the most popular 354 names from those decades, which captures the 23-62 year old demographic, which nearly covers the entire span of LinkedIn’s strongest representation.